Native to North America this variety will bloom first year if started indoors. 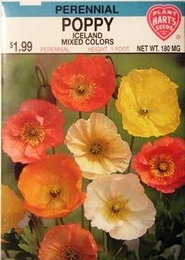 Delicate flowers in shades of reds, yellow, and white are 4 inches in diameter. Cut flowers in bud stage. Poppies blooms in late spring and early summer. Late plantings bloom following spring. Sowing Depth - press seeds lightly into soil.